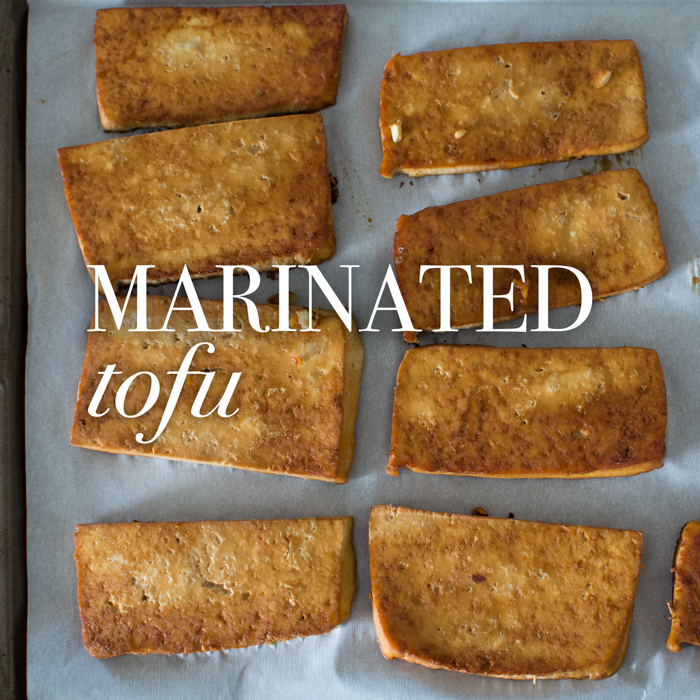 Today I wanted to share our most favorite way to make tofu. We call them marinated tofu steaks and they are mouth watering in every single way. Tofu has not been an easy thing for me to master. I will say it’s taken years. When I first became interested in tofu and vegetarian eating I bought two cookbooks, This Can’t be Tofu and The Tofu Cookbook. I was in my early twenties then and let’s just say I didn’t master tofu. I didn’t hate it, but I wasn’t excited about it. I preferred the meager offerings of Morningstar in the early 2000s. I’m happy to report that things have changed drastically since then. I’m reassured to know people irl that eat tofu. I even know people who aren’t vegan that eat tofu throughout the week. This recipe is one of those ways that we LOVE tofu. I think Jeremy and I would have fought over who has had more or less—wanting to make sure it was fair. Not all is fair in love and tofu. 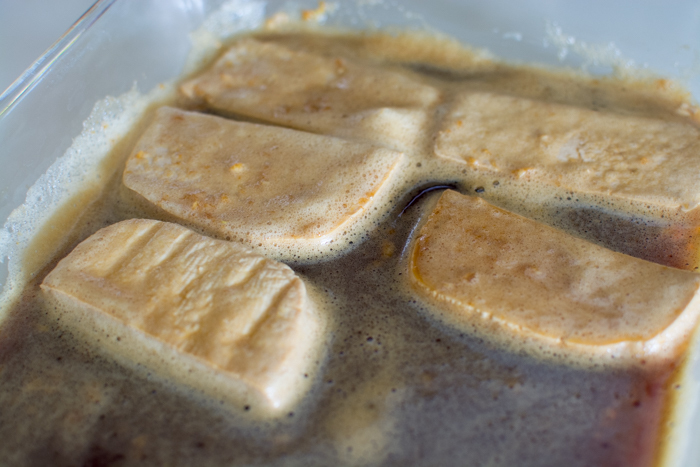 Marinating the tofu really allows for the rich tamari flavor to absorb. 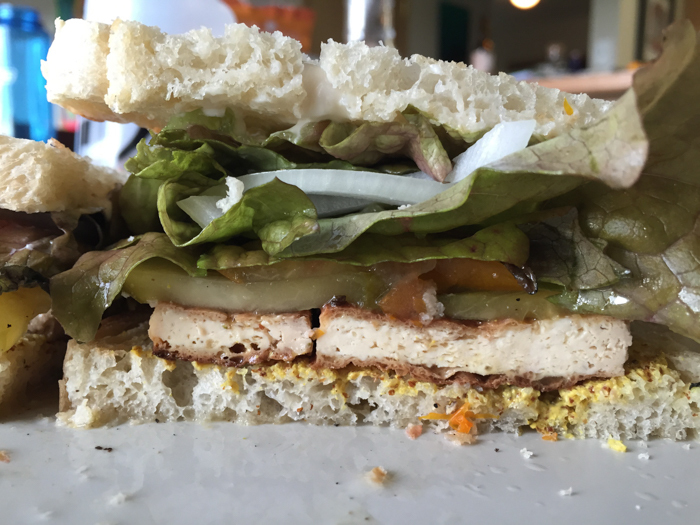 Think of tofu as chicken, on it’s own the flavor is mild and add any seasoning or sauce and you transport this wallflower protein to the next level. I swear by my non-stick skillet. It’s a wonderful way to cook without using oil or burning a delicious meal into a pan. 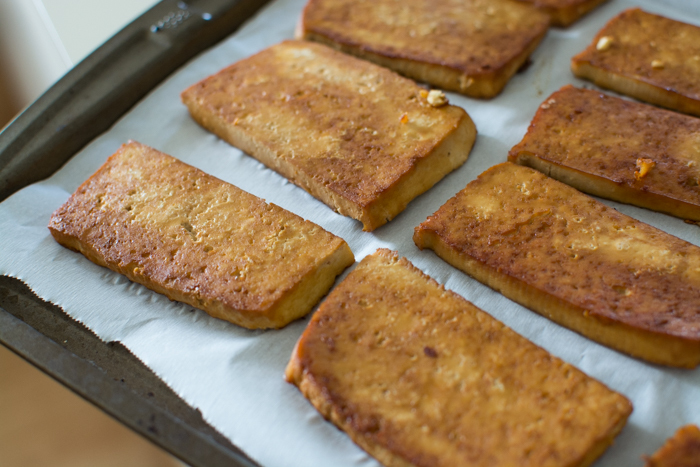 These tofu steaks are delicious right out of the pan, but if you want to firm them up and deepen the flavor a little bit. Pop them in the oven for a brief amount of cooking time. At the simplest we enjoy them as finger food. Snarfing down the tray all the while forgetting we wanted to make them into sandwiches the next day. Open the package of tofu and drain out the water. 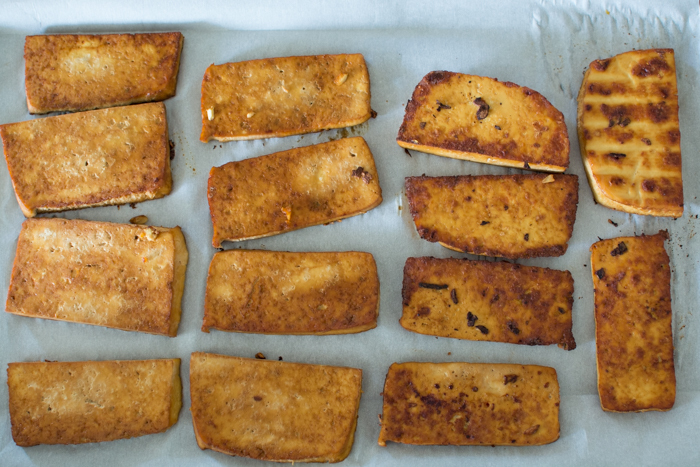 Remove the tofu and slice into 1/4-1/3 inch width pieces. Lay the pieces in an 8x8 or 8x13 glass container and cover with minced garlic and tamari. Add water until pieces are covered-if needed. Marinate for at least 20 minutes up to several hours for a stronger flavor. 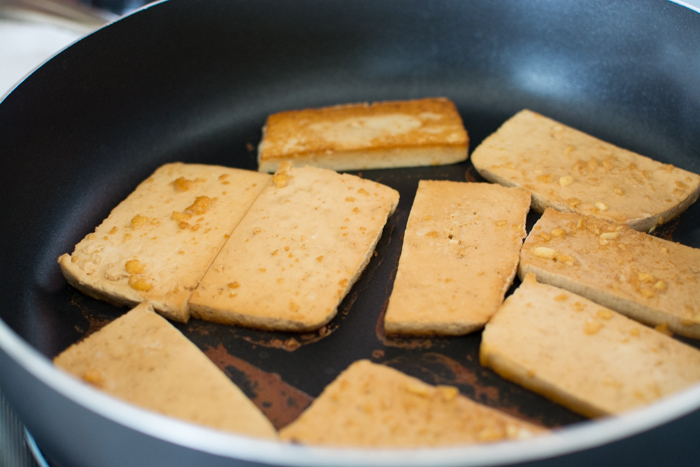 Using a non-stick skillet, sauté tofu with liquid on medium-low heat approximately 6-8 minutes a side. While they are cooking preheat the oven to 350F. Remove from heat and lay slices on a parchment paper lined pan. Bake for 10 minutes, then flip, and bake for another 10 minutes. Many tofu recipes require that tofu is pressed, this does not. You certainly can, but I’ve made this several times and I love the result either way. 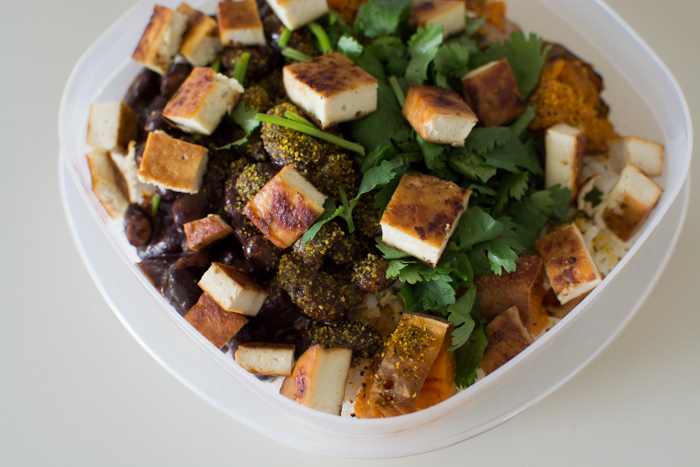 Chop and serve over a bed of rice, black beans, and cilantro. Another cool trick with this tofu is to put it in the fridge after it’s been cooked and let it cool down. If you’re meal prepping even better. After they’ve chilled they firm up even more and have a great salty chew to their texture. Which makes a perfect sandwich filler. 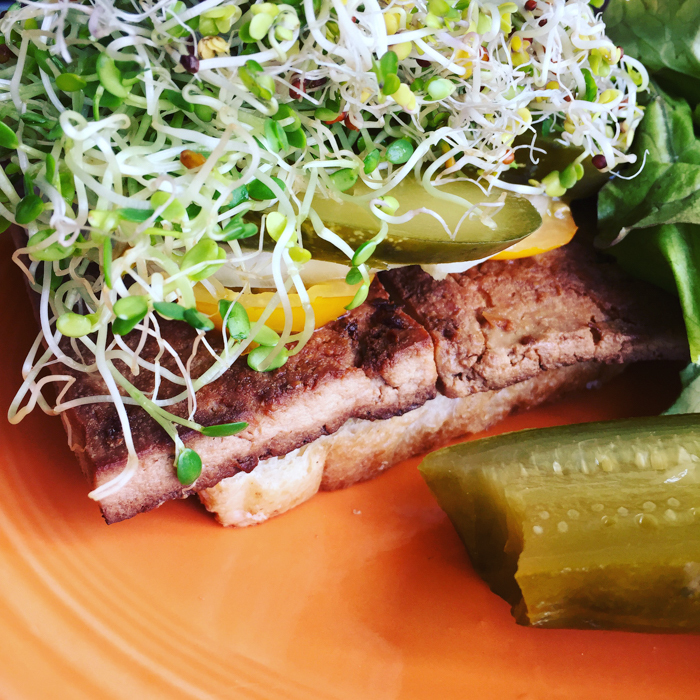 On a sandwich with mustard or garlic mayo, pickle, tomato, lettuce, and sprouts.